Matt Denton, of Micromagic Systems, posted a few cool videos of his latest hexapod in our forum today. You may remember news of his iC Hexapod making the rounds last year. The project he's showing off right now is the B.F. Hexapod (V5). 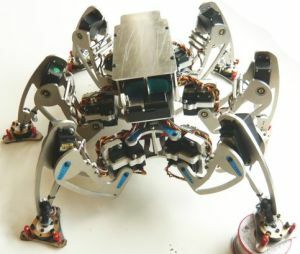 One of the main features of this robot is its adaptive walking style. Thanks to its gimbal-mounted, contact sensitive feet and its on-the-fly gait adjustments; it is perfectly suited to uneven terrain. If you want to discuss how awesome this robot is, visit the forum thread. Rest In Peace, Sir Arthur Charles Clarke. On behalf of all of the innovators, visionaries, and futurists of the world; we’d like to express our deepest respect in recognising the departure of a great mind from this wonderful and beautiful universe in which we all reside. Arthur C. Clarke, may we all forever bask in the light of your genius, and may your memory forever shine with the light of the stars.